SEO generates traffic and traffic results to sales. No one can deny the importance of search engine optimization for eCommerce business. 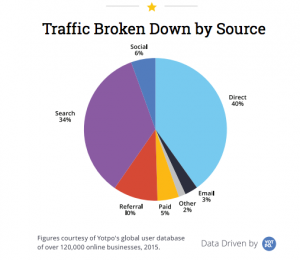 As per below pie chart, search engines yields 34% traffic for eCommerce stores. Thus, search engine optimization becomes the most important tactic if you want your online store to attract maximum traffic. Even online retailers agree to this. As per a recent survey – search engine marketing (paid and SEO) was considered as the most preferred customer acquisition tactic by the online retailers. 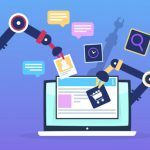 Thus, SEO is a very important digital marketing technique for eCommerce businesses. 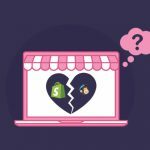 Even a single eCommerce SEO mistake can prove to be expensive for your business. You might argue, that you have an error-free eCommerce SEO strategy in place, still it is not working well for your online business. So, here we have come up with some eCommerce SEO mistakes being committed unknowingly, which if rectified can help your online business to maximize sales and revenue. 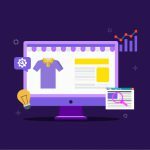 If the product descriptions on your eCommerce website are missing, duplicate or not providing enough details, then you are really harming your online business. It is extremely important to have quality product descriptions on your online store. The product descriptions should be detailed enough to help your customers take buying decision. Also, search engines would give preference to the website having detailed information on their product pages. You can also go through – 13 Smart Ways of Product Description Writing That Actually Convert. 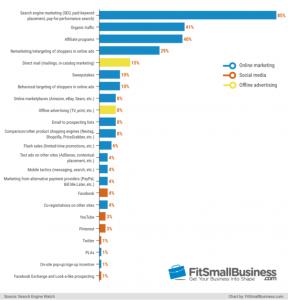 Gone are the days when the content was stuffed with keywords to gain high ranking. There is a lot of difference in presenting the content which helps the visitors and the content which is stuffed with keywords unnecessarily. The content on your website should make sense to the visitors. Your visitors should find your website content interesting to read. The content stuffed with keywords would just increase your website bounce rate and never help you with search engine ranking. User generated content has gained lot of importance these days. As part of the Product page, you can include Product Review section as well. You can easily overlook this feature as this content is user generated. In a way it adds up to the freshness of your content. All you have to do is to represent it in a way that increases the chances of readability so that maximum number of people can engage with it. Various studies show that nearly 70% of users are referring to product reviews before buying them. All the more reason for you to pay attention to this feature. Moreover, product reviews also gives you the opportunity to update your web pages with fresh content and that helps in gaining high search engine ranking. If you have too many elements on your eCommerce website which lowers down it’s loading speed then it can be a big obstacle in the growth of your online business. Ensure that your website loads quickly as that is not only an important user-friendly feature but also one of the basic criterion for listing your website high in SERPs. Security encryption (the website URL having HTTPS) using SSL certification encrypts the customer data while they transact. This is very much necessary to ensure that your customers have a safe shopping experience. The customers are not likely to return to your online store if they loose their confidential information. Moreover, Google would prefer to provide secure results to the searchers and thus would not list your website if it is lacking security encryption. Not adding alt image text is definitely going to fail you in achieving your search engine optimization goals. It is one of the cornerstones of your SEO efforts. Specially in case of an eCommerce website, the major chunk of the content is represented in the form of images. Since you already have titles, description, reviews etc. assigned to images, it will only take a little more effort to tag them with Alt texts. This enhances the value of these image blocks in front of search engine crawlers. Events such as clicking on a product, adding a product to a cart or checking out descriptive images on a particular product page can be tracked down as individual events in Google Analytics and can generate a lot of crucial information for the business owner. Failing to chalk out a proper event tracking mechanism will lead to a lot of missed opportunities. You may never know which content is working best for your customers and which content needs a lot of improvement. You will be shooting arrows in the dark. The product pages are the backbone of any eCommerce website. If your pages are not properly populated with the right set of keywords and content they will put off your potential customers and convince them to never visit your site again. Amazon is considered to be a good example when it comes to product pages. It quickly supplies the information in a clear and crisp manner and gets the customer moving through the buying journey. Inadvertently, many users are going to land on the 404 error page as you regularly update product information. This is quite normal but you don’t want your customers to become clueless at this stage as it may lead them to leave the website prematurely. Unfortunately, this is true for most of the websites where the 404 page fails to direct the customers back on track. In order to prevent this, you can design the 404 page in a way that it engages your customers as efficiently as any regular page on your website. You can add a custom made image as a background and even add features like a search bar or call to actions leading to a specific landing page. eCommerce SEO is not all about gaining high ranking in search engines, it is all about driving relevant traffic that converts. Your online store should provide easy shopping experience including navigation and checkout. Just like any other website, the eCommerce website is very much dependent on SEO for its success. One can’t ignore the cardinal rules of optimization and risk loosing out on valuable traffic. Having said that these are the key areas to focus on but not the only areas to focus on. If you have any more suggestions about the shared anecdotes, please do share them with us in the comments section below.